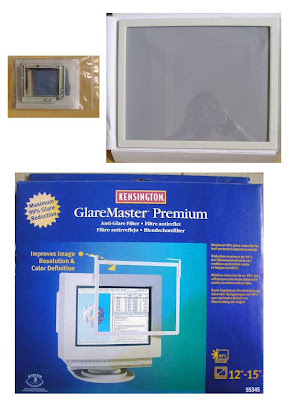 Kensington computer monitor filter 12" - 15"
3M computer monitor filter 12" - 15"
3M enclosed computer monitor filter 12" - 15"
3M computer monitor filter 16" - 19"
The CRT computer monitor emits large doses of EMF (the larger the screen the more) - a form of radiation that affects the eyes and even your general adversely - see internet sites for more info. Our computer monitor could be dangerous, as could your television. The dangerous types of monitors are CRTs, Cathode Ray Tubes. A CRT is a vacuum tube, with electrons flowing through. The electrons hit a fluorescent screen to produce a picture. 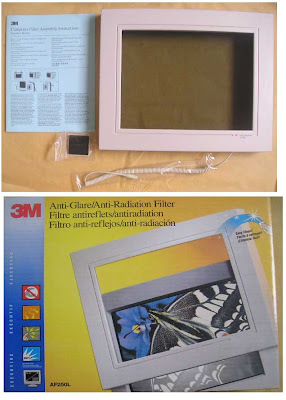 All CRT monitors give off radiation. Huge amounts of ELF (Extremely Low Frequency) and VLF (Very Low-Frequency) radiation is given off. If you sit closer than 29 inches from your screen, or within four foot from the side and back, you may be subjecting yourself to unacceptable amounts. Scientific research shows that these types of radiation can lead to many health complaints. X-rays are not to blame, as they use a different type of radiation that penetrates the human body; ELF and VLF however, get absorbed by bodily tissues. One of the many health risks of monitor radiation is the forming of cataracts. It is well known by scientists that radiation, when projected onto the eyeball causes heat, and long exposure can cause retinal detachment. Sensory nerve endings in the cornea and iris are very sensitive to temperature, even the smallest change. This minuscule heating of the iris by absorption of radiation is thought to be a major cause of cataracts. Viewing your monitor in a dark room increases the risk of eye damage. This is because your pupils enlarge to take in more light, therefore more radiation can get in. The radiation can also effect the reproductive system. It has been suggested that miscarriages and some birth defects can be caused by radiation breaking ionic bonds in the DNA. The static electricity caused by the monitor is also a hazard. The static builds up on the screen, and causes electrical charges to hit your face, causing skin irritation, headaches, nausea and dizziness. 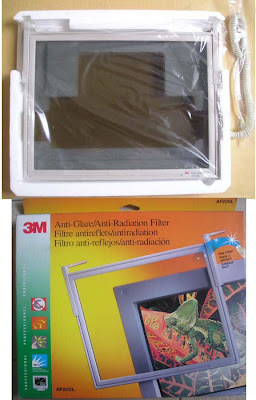 The very best way to protect yourself from the harmful rays that are produced, is to buy an LCD (Liquid Crystal Display) monitor. LCDs do not give off any radiation whatsoever, but come at a very high price. Packaging will be done with Foam and an Extra box to protect the contents. Shipping: RM7.00 by Parcel/Registered Post in Malaysia. Please see my other items in lelong.com.my user ID: jimjlk (as I am still putting more items in this site).